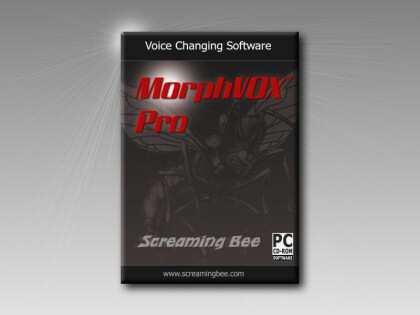 Screaming Bee is pleased to announce the release of MorphVOX Pro Voice Changer 4.0. MorphVOX Pro has a number of new features that improve on our previous versions of the popular voice changer. It includes a professional user interface using standard windows controls. The new interface allows users access to all the major voice controls in a single resizable window. The accessibility to these controls will greatly improve your productivity. In Addition, MorphVOX Pro now can import many more file formats, including Wave (.wav), Ogg Vorbis (.ogg), MP3 (.mp3), and Windows Media Formats (.wma). This allows you to morph your existing audio collection without having to convert the files formats yourself. Studios that use this tool can save time and potentially thousands of dollars by enhancing or creating multiple voices from existing stock audio or a single voice talent. Backup/Restore all your settings to a single file. Better list management for all your voices and sound effects. Plug-In support, allow for more features now and in the future. Multiple-user support, easily switch between different speakers. Try it out for a free, fully functional 7-day trial, just click here. If you have already purchased MorphVOX Pro 3.0 to 3.4, you can upgrade to the version 4.0 for only $10 USD. To take advantage of this offer, Click Here. For more information about MorphVOX Pro click here.